from 7:30 a.m. to 4:30 p.m. 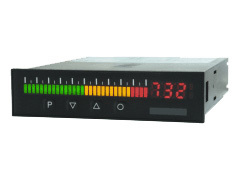 The MH-1U is a 3-digit digital indicator for top hat rail mounting. For the measurement of voltage/current, temperature and frequency. Optionally, the display can be extended with a sensor supply, an analogue output, an interface RS232 / RS485 (Modbus protocol), as well as 4 switching points. The new indicator ML2-2 was designed for metering of sensor signals and their presentation on a full graphic, coloured LCD display. Equipped with an multifunctional measuring input for the recording of singals for voltage, current, shunt, Pt100(0), Thermocouples, pulses, frequency, counter and rotational speed. Available in housing dimension 96x96mm. Modern high quality measuring instruments in LED-technique for all established sizes in panel-mounting, as well as accessories like adapter, blind covers and gauge head selector switch. Just as we offer solutions for built-on enclosures and top hat rail mounting. We offer our bargraph displays as well in a tricolour mode, so a type with a change of colour, for direct current /direct voltage, frequency and high measuring inputs. Since more than 25 years we produce digital measuring devices e.g. with multi-function measuring inputs or counter inputs. Just as set point device and current loop meters, as well as bargraph displays or interface devices are part of our product range. We offer 7-segment digital displays for measuring of melt pressure or temperature, as well as for resistance metering. Further more our range includes devices like two-channel meter or for metering of standard signals like current or voltage. 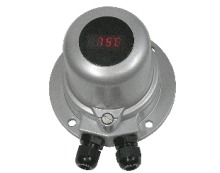 Further more we offer solutions like melt pressure sensors, pressure transducer or Pt100-resistance thermometer and a current loop specifically for hazardous areas. For established measuring inputs such as Pt100 and Thermocouple, as well as frequency and counter, we offer the applicable solution. Just as our range includes interface devices with RS232 /RS485, Profibus DP or BCD triggering. We develop for you custom-designed solutions like indicator tableaus, too. Ein Bargraph, auch als Leuchtband- oder Balkenanzeige bekannt, ist eine der verbreitetsten Anzeigearten – aus gutem Grund. Die Funktionsweise der Instrumente ist ebenso simpel wie auch genial: Die Länge des Balkens der Bargraphanzeigen zeigt die Größe des Signals und entsprechende Veränderungen an. Der Bargraph wird schneller angesteuert als eine entsprechende Ziffernanzeige und bietet eine anschaulichere visuelle Darstellung. Aufgrund ihrer technischen Eigenschaften eignen sich die leuchtstarken modernen Bargraphanzeigen unter anderem sehr gut für die Überwachung verschiedenster industrieller und anderer gewerblicher Prozesse. Bei der Auswahl entsprechender Einbauinstrumente werden digitale Varianten sehr häufig bevorzugt. MONTWILL bietet Ihnen eine umfangreiche Auswahl vertikal und horizontal ausgerichteter Bargraph- bzw. Balkenanzeigen – für viele Anwendungen und in verschiedenen Größen. Es sind Varianten für Frequenz sowie für Gleichspannung und Gleichstrom erhältlich. Die 5-stelligen Frequenz-Anzeigen verfügen über einen 270-Grad-Bargraphen und werden über Fronttaster oder Software konfiguriert. Unsere Bargraphanzeigen für Gleichstrom bzw. Spannung liefern wir entweder mit 270-Grad-Anzeige oder Segmentdisplay. Bei der Segmentanzeige ist ein Wechsel zwischen DOT- und Balkendarstellung möglich. Die Justage des Anzeigewerts erfolgt via Potentiometer. Die DC-Bargraphen erhalten Sie darüber hinaus auch in einer Variante für hohe Spannung. With good cause, a bargraph indicator is one of the most common digital indicators. The operating mode of these instruments is as simple as ingenious: The length of the bars of this indicator shows the size of the signal and the according changes. The bargraph indicator can be triggered faster than a corresponding numeric indicator and offers a more graphic visual presentation. Due to the technical features, the highly iluminous mordern bargraph indicators are most suitable for e.g. the monitoring of all different kind of industrial and other commercial processes. When it comes to selecting appropriate panel meters, these digital types are often preferred. MONTWILL offers a large choice of vertical and horizontal aligned bargraph indicators, for many applications and in different sizes. Available are indictor types for frequency, direct current and direct voltage signals. 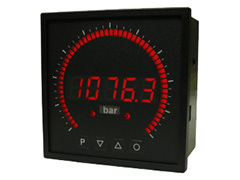 The 5-digit frequency indicators come with a 270ï¿½ bargraph indicator and are adjusted via the front keys or via software. 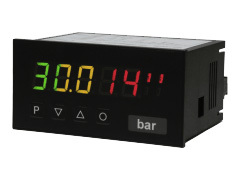 Our bargraph indicators for direct current/direct voltage can be equipped with a 270ï¿½ display or a standard display. With the standard display, a change between DOT and BAR display is possible. The adjustment of the display value happens via potentiometer. DC-bargraphs are available as high voltage version, too.